How to get there: For general access to Holøydal, see the description under Elgspiggen. Coming from Tolga (north), you drive by the church in Holøydal on your left, then the access to the Elgspiggen trailhead on your right. Continue 300 meter uphill and make a left turn just as you get to the top of the hill. Coming from the south, this is about 17.3 kilometer north on Hwy. 26 from the Y-shaped fork where the right forking road is signed to Røros. After the turn, drive 800 meter along this road to locate parking just before the gate (near Nygård) for the road that runs up the Øversjødalen valley. In summer, one may drive this road to the Øversjøen farm for an even shorter route to this summit. The winter trailhead is located at N62:12.705, E011:28.368, elevation 783 meter. Route description: Ski the road for about 2.5 kilometer to the Øversjøen farm. From here, you see the two creeks coming down the mountain. Pick a route between the two creeks, a good line is to ascend more or less along the line of a summer trail that is indicated on the map. This route will ascend fairly near the rightmost creek, but staying on the higher ground. Higher up, as you leave the trees behind, the slope becomes more gentle and the creek may not be easy to see in winter. Make sure that you ascend directly towards the saddle marked as 1426 between the two Sålekinna summits. Do not head into the shallow valley between Hammaren (1265) and Sålekinna thinking that you follow the creek. 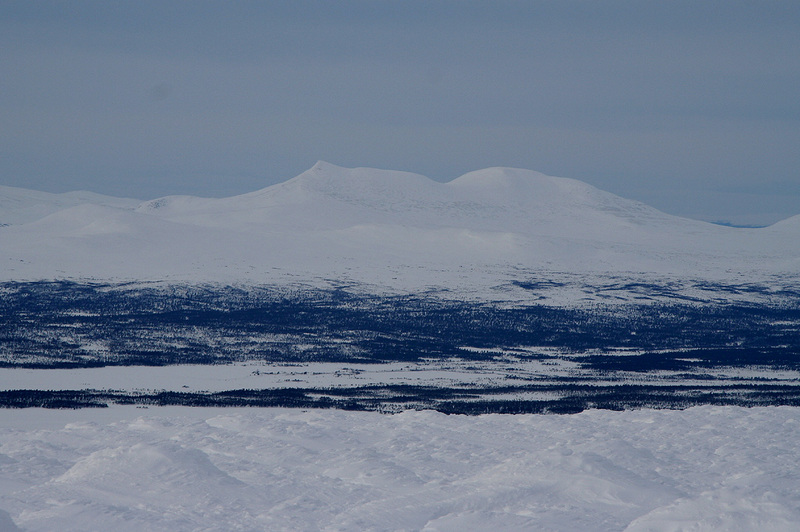 From the saddle, ascend north to the flat summit plateau of Sålekinna. This ascent is straightforward. Consider also visiting the south summit, located one kilometer south from the saddle. This summit is only 4 meter lower and looks like the better viewpoint. Comments: We got up at 0600, had a solid breakfast (eggs and mushrooms), then left Johnsgård and drove to the trailhead. It turned out to be a small parking area about 200 meter beyond the (open) gate. As we prepared to leave a woman started shouting from a nearby (bedroom) window. Impossible to comprehend in the wind, however as I walked closer, not surprisingly, she complained about the parking. A tractor needed to pass, as I told her that there would be no problem, a new story was quickly invented: they expected another car (there was space for 5 more cars inside their own property). I decided not to argue, no problem to move the car 200 meter back. The parking was clearly outside of anybodys property, however, no point in further discussing with an unfriendly woman that thinks she owns the mountain. We got underway at 0750, the first part of the route follows a prepared ski track that runs on the summer road. Thus we quickly reached the small side road serving the Øversjøen farm. From here, we had to break trail and Pål Jørgen picked a good line ascending through open passages among the birch trees, then contouring higher up on the left side of the pretty deep gorge made by the creek Store Gravskardbekken. At about 1100 meter of elevation, we lost most of the visibility, a compass bearing to the 1426 meter saddle gave us a good initial direction. I assumed that the terrain would pretty much guide us up to the saddle as soon as we were above the 1300 meter contour. Thus, we arrived at the saddle in a complete white-out and it seemed clear that the trip should be completed without any further delays. The uphill slope to the north was not bad to ski, but going zig-zag against the wind was slow and skiing back down would not be much easier. Thus, we left the skis at elevation 1543 meter, just 50 vertical meter short of the summit. Proceeding on foot, we could ascend directly uphill and soon the terrain became flat. The summit plateau was covered by deep, soft snow making walking difficult as we sunk in to our knees. We continued across guided by our GPS until it declared that we had reached the summit at 1030. The elevation reading was 1595 meter, right on the spot, but no cairn could be seen. The wind was raging at strong gale (small storm) and we could only see one armlength ahead. Turning and seeing in the direction of the wind was somewhat better. We therefore continued another 30 meter, with the GPS reading 1590, then turned and looked back. Still no cairn to be seen. A few bumps that might be the top of a burried cairn, but no clear candidate. Satisfied that we were on a pretty flat summit plateau, we declared that the mountain had been climbed and started back down. We had planned to also visit the south summit. This summit being only 4 meter lower and with more than 100 meter of prominence, appears to be the best viewpoint. However, under the blizzard conditions there would be no views and we could use the time as we had a long drive back home. We were back at the car at 1200 sharp. New, dry clothes then getting ready for the long drive home. It turned out that the shortest drive went south via Elverum and Hamar. We started driving at 1215, and parked at home at 2120, 673.5 kilometer from the trailhead. 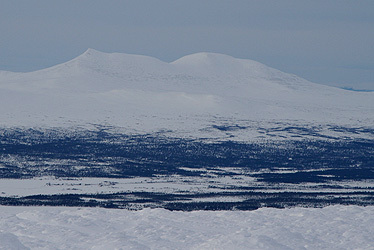 Sålekinna, as seen from Elgåhogna. The pointed summit is the lower south summit. There are no pictures from the trip, since the weather was so BAD that the camera would instantly have been plastered by snow if removed from the backpack.